I'm back with another App Inventor tutorial for you. This time around, I have a simple tutorial that demonstrates an app that is able to convert your voice to text and, in turn, that text back to voice. Google does all of the heavy lifting in regards to converting voice and text, and thankfully makes it very easy to tap into those resources. 1. Click on My Projects, then create a new project. I called mine VoiceApp. 3. Now drag a Button from the left column under Basic onto the palette. 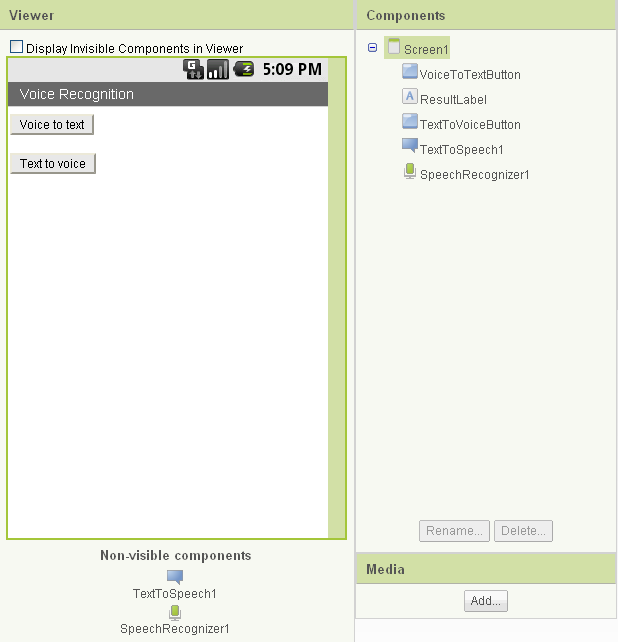 Select the button in the Components column and click Rename to change the name to VoiceToTextButton. Then, in the Properties column, set the Text to "Voice to Text." 4. Next, drag in a Label and place below the VoiceToTextButton. Rename the label to ResultLabel and set the Text field to "". 5. Drag in another Button and place below ResultLabel. Rename to TextToVoiceButton and set Text field to "Text to voice." 6. Now, expand the Other Stuff tab in the left column and drag two final components onto the palette: SpeechRecognizer and TextToSpeech. NOTE: These are non-visible components and so will appear below the palette. We need to handle the Voice to text button click event first. In this, we simply tell the SpeechRecognizer1 to start listening. The BeforeGettingText function clears our label so the words spoken can be displayed there. The AfterGettingText function sets our label to the words spoken. 10. To go the other way--text to voice--we handle the click event of the other button. TextToSpeech1.Speak has an output parameter that we set to our label.text field. 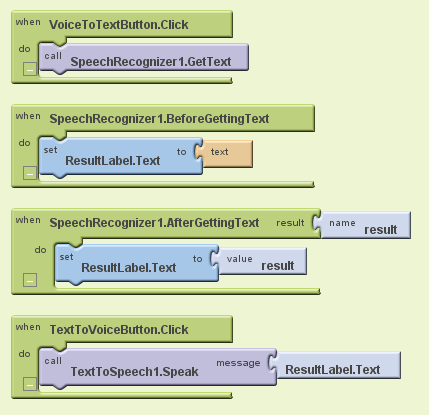 So there's the code (layout and blocks) required for building a simple voice-to-text and text-to-voice application. Hi my friend, great tutorials I must say! how can i do a project like put the word hello in press a translate button and changes to another word. hi guys!my name is mahmoud and am from africa, i need help on my project and its important. can somebody please contact me via my mail for mentorship. thanks in advance. Is it possible to create Text/String to Sound? 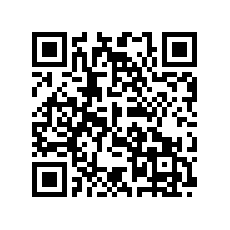 The text is base64 format of an encrypted text or string. and vice versa from sound to encrypted string which then will be passed to a function to decrypt the text/string? Thanks! This was extremely helpful! I wanted to share helpful site for voice recognition: convert voice recording to text. Hope this helps someone! Thanks admin for spending your valuable time to write an excellent article. Thanks for information i also interested in learning for your blog. At Very Affordable Rates.Powered By Native Transcribers, We Deliver Great Quality.Chat With Us Now!.